BESTEK® Advantage: Great compartments for various things, DSLR camera, 2 lenses, flash, phone, chargers, tablet, etc. Front iPad Tablet Magazine Pocket, 2 small button-down pockets & internal zipper pocket. Waterproof Canvas Bag with top flap and over one shoulder or cross-body strap for comfort on the go. BESTEK® Canvas Camera Shoulder Bag is customized with all SLR DSLR and its accessories, especially a large front pocket for iPad and magazine, and its fully padded insert not only separates DSLR from accessories but offers a shock-proof protection. 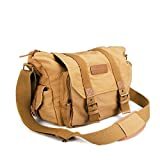 This camera messenger bag is well-made of waterproof canvas material, has great compartments for various things, comfortable on the go, casual, and practical in travelling, hiking, photographing, and other outdoor activities. When you fetch the separate insert out, this photography bag becomes so large and roomy, casual messenger bag even as a school bag as you like. • No matter what equipment you use, the removable interior of the BESTEK camera bag can be adjusted to fit a DSLR camera body, up to three lenses, and other accessories. • Outer Bag Size: 15 x 7x 11 inches, Camera Insert Size: 12 x 5x 7 inches. • Don’t worry about leaving your iPad at home. The large gadget bag located in front compartment that is able to fit iPad Tablet and other small devices. • Additional 2 side pockets outside offer a space for a cell phone and other electronics and accessories. • Canvas material, durable and waterproof to protect your belongings from raining. Notes: Please check the dimensions of your camera to ensure it fit the size properly. Camera Bag ONLY, Other device and accessories not included. This entry was posted in Discount Photography and tagged Accessories, BESTEK, Camera, Canon/Nikon/Sony/Pentax, Canvas, Case, Digital, DSLR, Insert, Khaki, Messenger, Pocket, Shockproof, Shoulder, Tablet, Waterproof by Ball Photo. Bookmark the permalink.